Cloud-based technologies have changed the game of the IT world almost entirely. There is no denying the fact that businesses need to constantly adapt to the changing trends in order to survive in the market for long. Data that used to be stored, transmitted, and accessed via various traditional methods such as a USB, hard drives, internal or data transmitting systems are now being accessed on the cloud. The trend of cloud computing has widely been accepted and embraced by people from all across the globe due to its numerous benefits. Individuals and organizations are moving one step ahead of the game by employing and integrating custom cloud solutions and delivery models, as they can help employees achieve work efficiency, which further leads them to achieve a company’s strategic goals faster than anticipated. Organizations are now more willing to adapt to emerging cloud trends as setting up and upgrading in-house infrastructure and software is costly. Since individuals and organizations have varying business needs and requirements, they need to have custom cloud solutions tailored to their business specifications. Undoubtedly, cloud computing has become the need of the hour and companies need to embrace the latest cloud computing trends to address their business needs with speed and efficiency. We may not have noticed that we all use cloud technology in one form or another since we are all so accustomed to using different social media apps and platforms for different purposes. Custom cloud solutions reduce capital expenditures, are easy to maintain and upgrade, and ensure business continuity for long-term success. Cloud computing is largely seen as an innovative technology, changing the fate of companies from across the globe. Besides keeping data stored in a repository, you can backup important data such as files, apps and more to the cloud without having to worry much about data theft. 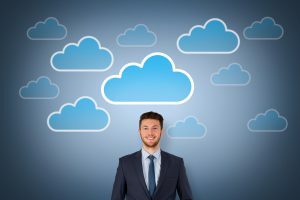 Cloud technology is spreading because it has earned the reputation of being highly stable and secure. Custom cloud solutions provide data security and safety to companies which signifies that they can recover their sensitive data, details of bank accounts, bookkeeping and other financial records, passwords and other similar things on any device, allowing them greater flexibility. The beauty of the cloud is that it is customizable. You can design your own custom cloud solutions that fit the needs and specifications of your business. Customizing the cloud can be an intimidating task which is why hiring an expert to do the job is recommended. There is no such thing as a one-size-fits-all-solution. You must constantly monitor the changing needs of your business and upgrade your cloud at regular intervals, when suited best. Customization is often perceived as an expensive task, however, it’s not! The magnificence of the cloud is that it’s a low-risk, low-cost solution that can be customized according to your own will and desire aligned with your business specifications and evolving needs. Experts provide their input in setting up the right custom cloud solution for your business which is likely to increase your working efficiency and productivity. Besides that, you will have 24/7 expert support for meeting data shortages and loss of data. By embracing cloud technology, you can stay connected to your business and the world from anywhere, on any device. Cloud computing is opening doors of opportunity for virtual teams to access key information on the server in their own comfort zones. Custom cloud solutions are environment-friendly and helps you to innovate and lead from the front with improved data security and compliance. Gone are the days when employees who needed to stand out from the crowd had to spend extra hours in offices for increasing their productivity. Now, they can easily increase their efficiency and productivity by working from a remote location or anywhere in the entire world.